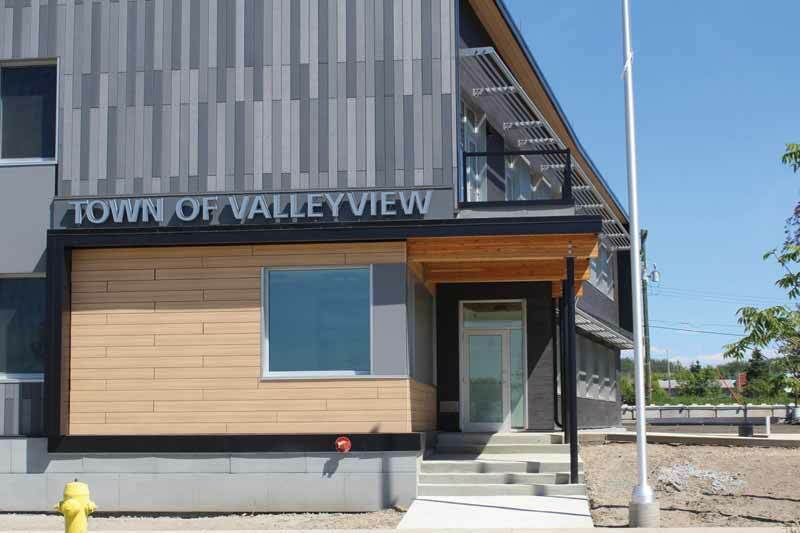 Completed in the summer of 2018, Alberta’s Valleyview Town Hall is the result of extensive collaboration between the municipality, the contractor, and a skilled team of designers including Scott Builders, Flechas Architecture, Marken Design + Consulting, Integral Group, Laviolette Engineering, Helix Engineering, Kobayashi + Zedda Architects, ReNu Building Science, Williams Engineering, and Kinnikinnick Studio. These parties worked together to target Passive House certification in a northern climate, aiming to create the first building in Alberta to achieve Passive House Classic certification and the first in the world to obtain Passive House Plus certification. Located 350 km (217 ½ mi) north of Edmonton, the Town of Valleyview experiences a humid continental climate with long, cold winters and short, mild summers. Although temperatures can dip below zero from October through April, on average, local temperatures range from 22 C (72 F) in the summer to –20 C (–4 F) in the winter. Further, hours of sunlight in the region go from approximately 307.5 in the summer to 100.8 in the winter months. As a comparison, temperatures in Vancouver (the city with the highest number of Passive House buildings in Canada) rarely dip below zero and daylight hours range from 290 in the summer to 56.5 in the winter. When the original town hall approached the end of its life, it became too expensive to run and maintain, as its heating systems could no longer keep habitable indoor temperatures in the colder months in an energy- and cost-efficient manner. The building also required significant interior renovations to update its functional layout, which would have required extensive system upgrades to meet the current building code. The main entrance of Alberta’s Valleyview Town Hall framed by a human-scaled canopy with a raised roofline, superimposed by a glass fibre-reinforced (GFRC) wall on the second storey. Consequently, after considering the option of retrofitting and upgrading the existing building to extend its life for another 25 years, the town council decided on creating a new structure that would help lower operation and maintenance costs, as well as reduce greenhouse gas (GHG) emissions. This building would also be more fiscally responsible, as its sustainable design would help minimize the costs of long-term operation for the next 80 years. 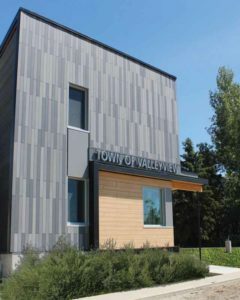 Learning from the experience the town manager, Marty Paradine, had with the Passive House standard, the council realized the financial and environmental advantages of building the new town hall to meet the standard. In 2012, Paradine participated in the development of the City of Fort St. John’s Passive House, an award-winning demonstration project in northern British Columbia that showcased the energy-efficiency potential the standard offers for single-family homes at a lower cost. Passive House certification is a German green building standard published by the Passive House Institute (PHI). It combines energy efficiency with optimal comfort, long-term affordability, and good indoor air quality (IAQ). Achieving certification meant producing a long-lasting, high-quality building that would guarantee year-round thermal comfort and a 90 per cent reduction in heating and cooling costs. Further, meeting the Passive House standard would allow the building to become net zero with a minimum investment and ensure it could stand the test of time in terms of quality, efficiency, and future building code amendments in case of expansion.